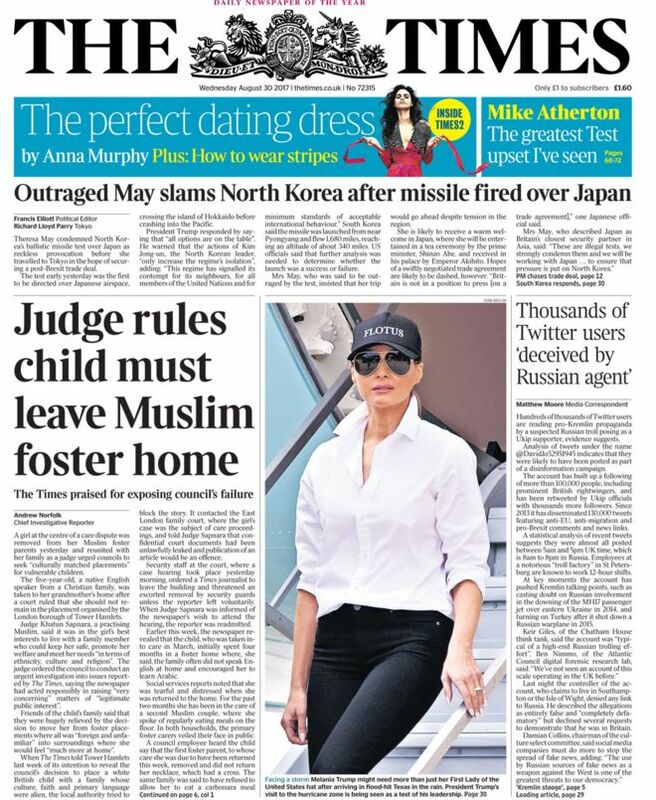 A family court judge has praised The Times for raising “very concerning” matters of “legitimate public interest” after it broke the story of a Christian girl placed into foster care with Muslim families. The paper revealed this week that a five-year-old had been twice placed in homes that were of a different racial, religious, cultural and linguistic background to her own by Tower Hamlets Council. Judge Khatun Sapnara told the council in a case hearing yesterday to conduct an urgent investigation into the issues reported by The Times, the paper said today, and to place the girl in the care of her grandmother. 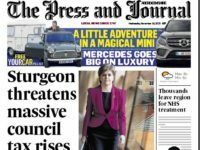 The paper also revealed the council had attempted to “block” publication of the story by chief investigative reporter Andrew Norfolk. “[The council] contacted the East London family court, where the girl’s case was the subject of care proceedings, and told Judge Sapnara that confidential court documents had been unlawfully leaked and publication of an article would be an offence,” said the Times. “Security staff at the court, where a case hearing took place yesterday morning, ordered a Times journalist to leave the building and threatened an escorted removal by security guards unless the reporter left voluntarily. The judge was said to have told the court that she “would not stand in the way of the freedom of the press to report, within the law and in a responsible manner, in respect of this case”. 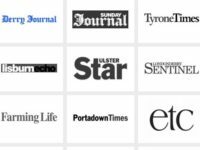 She added: “We are disappointed with the tone of some of the media coverage, especially given the judge’s comments yesterday that reporting has been intrusive for both the child and the foster carer. “While we cannot go into details of a case that would identify a child in foster care, there are also inaccuracies in the reporting of it. For example, the child was in fact fostered by an English speaking family of mixed race. Judge Sapnara said her decision remove the child from foster care was not taken “as a result of undue media involvement” but rather “because of the evidence available to the court today, that the grandmother is an appropriate carer for the child”. 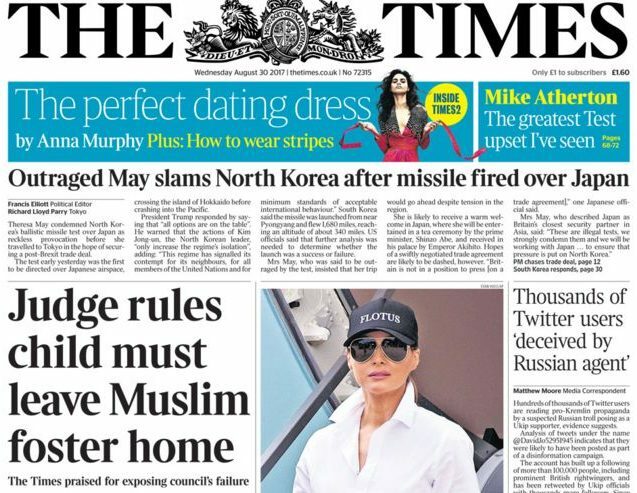 What The Times article actually says is: ‘Judge Khatun Sapnara, a practising Muslim, said it was in the girl’s best interests to live with a family member who could keep her safe, promote her welfare and meet her needs “in terms of ethnicity, culture and religion”. The judge ordered the council to conduct an urgent investigation into issues reported by The Times, saying the newspaper had acted responsibly in raising “very concerning” matters of “legitimate public interest”‘. It doesn’t actually mention ‘reporting’ at all, it simply talks about raising matters of public interest. However, in raising these matters, the paper’s ‘reporting’ actually distorted and falsified the facts of the case. So, just to add to the pack of lies surrounding this case, Press Gazette runs an inaccurate headline about it. What a wonderful example you’re setting.